The tax bill that was recently agreed upon by a legislative conference in the House and Senate, and which looks to become law this week, included a provision that was greeted by many in the craft beer world as a victory for their industry—a reduction in the per-barrel tax from $7 to $3.50 for the first 60,000 barrels produced by any brewer that makes fewer than two million barrels a year. While that tax break has a two-year sunset provision, meaning it will expire at the end of 2019 without further action by Congress, it will still result in substantial savings for the industry as a whole. For many craft brewers struggling to survive in an increasingly competitive industry with 6,000 peers, the news was greeted with elation. The Brewers Association argues that the legislation would result in $37.5 million in savings for craft brewers, money which could be used to “strengthen our nation’s smallest brewers and support their efforts to maintain and generate jobs.” Many brewers and publications are calling it a big win for small and independent brewers. But with craft beer’s historical emphasis on a community ethos, it might not be such a clear win, depending on how you look at it. Relieving part of the tax burden on smaller brewers—and small businesses generally—is something progressives should support in theory. Last week, I spoke with Chris Lohring, the founder of Massachusetts-based Notch Brewing, which makes about 13,000 barrels a year and distributes exclusively in part of New England. “I’m a leftist and my politics are left and taxes are an important mechanism to fund the things we need to fund,” he told me. But he also argued that some smaller operations pay more in taxes than they make in profits. “Small brewers could use the tax relief,” he argued, which “would make its way into salary and payroll.” For Notch, the Senate bill would save the company $50,000 a year. “That’s a job,” he explained. Verratti, whose company was founded in 2014 and produced about 1,700 barrels this year, noted that such savings can be especially important for businesses in their first five years, when what looks like profit to the IRS actually needs to get invested back into the business to help make it viable and grow. But there are a few points of tension with the idea that lowering taxes is an unmitigated boon for small brewers. First, the Senate bill also included a break for larger beer-makers, from $18 to $16 on the first six million barrels. For comparison's sake, imagine a small indie brewer that makes 1,000 barrels a year and a conglomerate that makes six million. For the small operation, that’s a savings of $3,500 a year. But for the larger brewer, that means $12 million in pure gravy that didn’t exist before. The relative gains that this bill affords larger organizations could allow them to out-produce, out-stock, and out-compete their smaller competitors. Verratti, though, rejects this logic and doesn’t think that taxes are a zero-sum game. “I don’t understand the idea that I should only support a tax cut if it helps me and doesn’t help everybody else.” Indeed, it was a forced alignment of interests in the excise tax bill that pairs small independent brewers on the same ticket as the likes of Anheuser-Busch InBev after years of failed attempts to get the Small BREW Act passed, which was specific to small independent brewers. By joining with The Beer Institute lobbying group, which historically represents the interests of the largest brewers, the Brewers Association was able to ride those more powerful coattails to within reach of victory. The bill also creates fresh uncertainty for small businesses everywhere. It eliminates a popular manufacturing deduction known as DPAD (Domestic Production Activities Deduction) that, for many brewers, would offset some of the excise tax savings. Verratti says that the new lower rate for “C Corporations” (which have boards of directors and quarterly meetings) versus “pass-through companies” (where the individual owners assume the tax liability themselves) might lead to many small businesses declaring themselves the former instead of the latter. The final problem with high-fiving over a drastic decrease in any alcohol tax is less about the bottom line and more about how brewers of all sizes understand their role as both employers and providers of something people love, as well as contributors to major public health crises like alcoholism, drunk driving, and absenteeism. 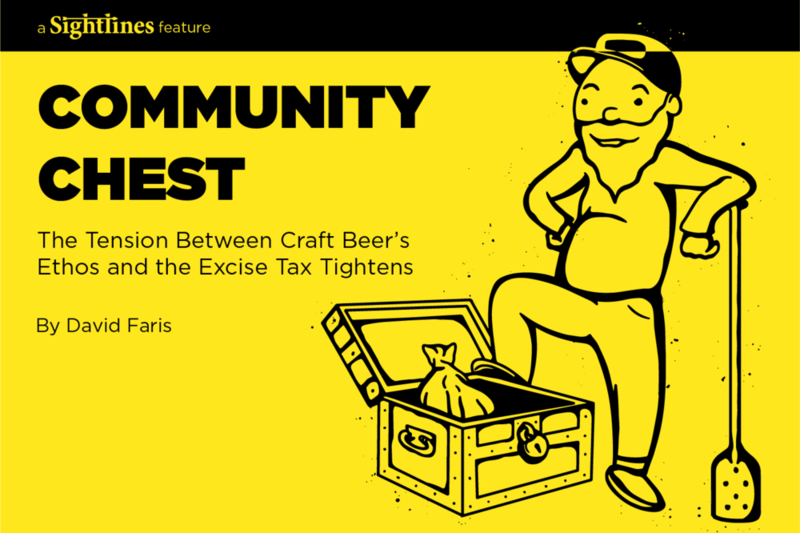 Vice taxes on barrels of beer represent a middle ground between Prohibition-style alcohol hysteria, and the kind of freewheeling boozetopia that many American drinkers would prefer. Lohring, for instance, supports the idea in principle, but worries that the taxes levied on beermakers don’t actually contribute to harm mitigation in the broader society. “I’m cynical about trying to earmark revenue from a tax, that it actually goes back to addressing that societal problem,” he said. And indeed, especially since Congress did away with earmarks (which allow legislators to direct funds to specific projects) in 2011, there is simply no way to know whether these taxes are actually funding harm-mitigation programs or just getting dumped into the budget blob in DC. In a broader sense, the tax code involves more than an arid appraisal of what the various rates should be for individuals and corporations. As it has evolved in the United States, it also embodies a set of shared social values, and represents the judgment of society about the kinds of behaviors that should be encouraged, discouraged, or moderated. America’s tax laws include a dizzying array of deductions to encourage or reward certain behaviors—for couples to adopt children, for individuals to invest in owning their own home—and to discourage others. While these laws have their detractors who dismiss them as chicanery and “social engineering,” the reality is that there are too many stakeholders embedded in too many corners of the tax code to do away with the whole idea. The story of vice taxes is that Americans have long had a conflicted relationship with the sale and consumption of alcohol. From Blue Laws that ban the sale of alcohol on Sundays in some states, to laws in places like Pennsylvania that grant the government a monopoly on the sale of certain drinks, the social fervor that led to Prohibition—a fear that alcohol turns too many people into godless wastrels and exacts a terrible toll on society—remains very much a part of the American fabric. The alcohol industry creates millions of jobs in the United States. Most individuals who enjoy beer, wine, and liquor are able to do so in moderation, and legions of Americans have developed an affinity for and appreciation of the deep stories and rich local traditions of craft brewing, an industry that has completely upended the way Americans drink beer over the past 20 years. But it also produces a reaping of human suffering that both small and large brewers should be willing to help prevent. From the roughly 88,000 Americans who died from alcohol-related causes in 2016, to the nearly 10,000 people killed in a crash last year involving drinking, there really can be no question that the industry has a social responsibility to help mitigate the harm from the abuse of its products. Problem drinkers racked up more than $249 billion in direct costs to American society in 2010. And there are still states where listing ABV on a package is not required. The attempt to ban the sale and consumption of alcohol in the United States between 1920 and 1933 was obviously an unmitigated disaster. All it did was drive the industry underground and gift a profitable business enterprise to organized criminals and racketeers. The repeal of Prohibition was a recognition that this policy had failed, and that society must find other ways to mitigate the harm of alcohol drinking. But slashing taxes on brewers—whether large or small—risks inviting a backlash from social and political forces, some of which are still quite active. These organizations carry on the tradition of temperance and prohibition and continue to seek legal changes that really would have a negative impact on the industry as a whole, such as lowering the legal limit for blood-alcohol content (BAC) to 0.05, a threshold some people would cross with a single beer. A renewed invitation to that socio-political fight would cripple the operation of thousands of bars, restaurants, and newly minted taprooms in places where public transit is limited. It would be particularly problematic for craft brewers whose stock-in-trade is higher-gravity beers. Furthermore, craft brewers should take into consideration the larger context of this tax bill—a misshapen monstrosity that will almost exclusively reward rich people, shelter their investment income from taxation, and deepen America’s inequality crisis. “It’s not a good look,” a conflicted Lohring told me while wondering aloud whether unrelated provisions in the larger bill will hurt small business owners. Verratti voices fears about what the other parts of this bill will do to her customers and community. “I’m very concerned about what it’s going to do to the local economy around here,” she said of her Maryland home. “People are going to be less willing to go out and spend their money.” Like Lohring, she would have preferred to see the provisions for craft beer passed separately rather than crammed into a huge and unpopular tax reform bill. Do craft brewers want to make it at the expense of, for instance, children who need health insurance, or poor folks whose lives are in the hands of programs like Medicaid? Unless they sell beer exclusively to hedge fund managers and the large adult children of people with tax shelters in the Caymans, brewers should also consider the impact on their industry when it’s taking money out of the hands of working people and sending it straight to the wealthy and older Americans. As Greg Parnas writes for DC Beer, the industry “continues to rely on younger Americans to fuel its growth,” and the larger tax bill conducts a kind of generational warfare against millenials. It may be true, as both Verratti and Lohring told me, that the only way to get a break for craft beer built into any legislation is to tack it onto something else. But brewers should think long and hard about whether this tax bill is something they can live with, and whether its broader social implications are worth supporting. It’s hard to blame craft brewers for welcoming legislation that will improve their bottom line, allow them to expand operations, and provide good-paying jobs in their communities. But if they do embrace this bill, craft brewers should consider directing some of their savings to community programs fighting alcoholism, and doing more to become leaders in both private and public efforts to reduce the number of problem drinkers in the United States. “I do personally believe that drug addiction and alcoholism are very real issues that need to be addressed by our society,” Verratti told me. While that sentiment is no doubt shared by most responsible craft brewers, if the industry spent as much time lobbying for increased spending on things like addiction programs as it does on tax breaks, it would help keep the teetotalers at bay while saving lives in their own communities. And we’d certainly drink to that.